Time for a Trip to the Zoo!!! Going to the zoo is my favorite field trip to take with primary grade students. When I taught Kindergarten in Seoul, Korea we took a field trip to the Seoul National Zoo. Believe it or not we saw a baby buffalo being born!!!! Whether you have a zoo near by or not, young children love learning about zoo animals! I have found some awesome resources to share with all of you! Let's start with some great books for Shared Reading Time. Amazon has a huge list which you can access by clicking on this wonderful book below. If you are looking for facts about each zoo animal, I found this great website called Science Kids which you can access by clicking on the picture below. I found lots of interesting facts about many zoo animals. Did you know that lions who live in the wild rest for 20 hours a day? Sounds just like my 2 cats. How about some free zoo animal poems? I found 5 cute ones at this site which you can access by clicking on the picture below. How about some adorable zoo animal puppets like the ones below? How fun to make and let your students interact with them! Makes me wish I was teaching in K or 1st. I found so many free crafts and printables at Busy Bees Kids Krafts.com -They even have mini picture books you can download! Finally I found a super website that has all the templates and directions to make folding zoo animals that you see in the picture below. They look adorable! Wow! 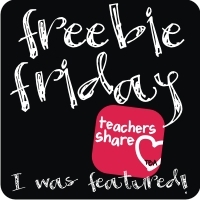 That was a lot of wonderful free resources! 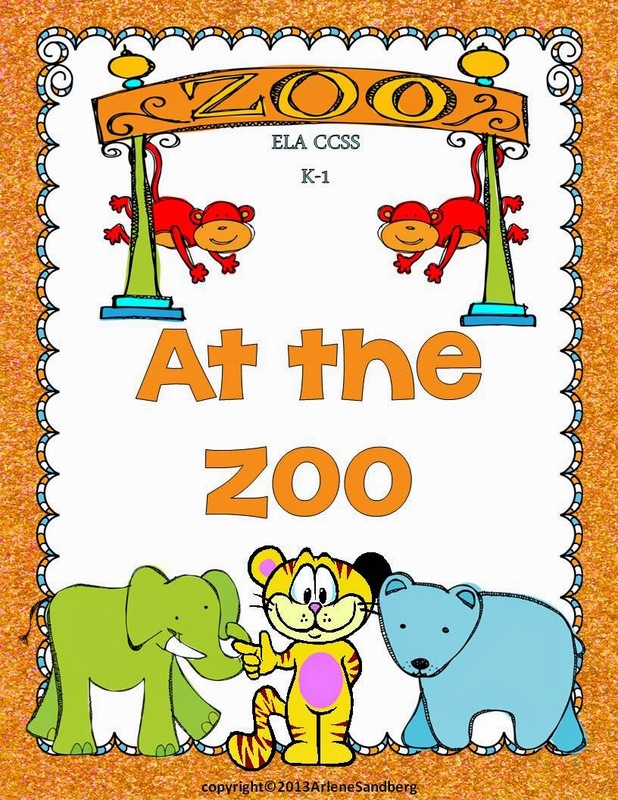 You might also like my newest product, "At the Zoo" for K-1. This product has been revised and updated in April of 2014. 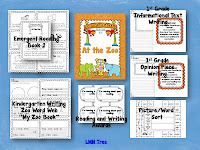 It includes my own Shared Reading Book, 3 different leveled Guided Reading Books, Word Wall .......and lots of Writing Activities which you see in the picture below. If you would like to check it out just click on the picture below. I also created a fun packet called "Zookeeper, Zookeeper, What Do You See?" 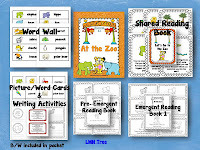 It has a Shared Reading Book and Make and Take Books at the K-1 levels about what the zookeeper saw at the zoo. There are writing activities included, too. Just click on the picture below to download the Preview to see sample pages of all the materials in this packet. This product has also been revised in updated. 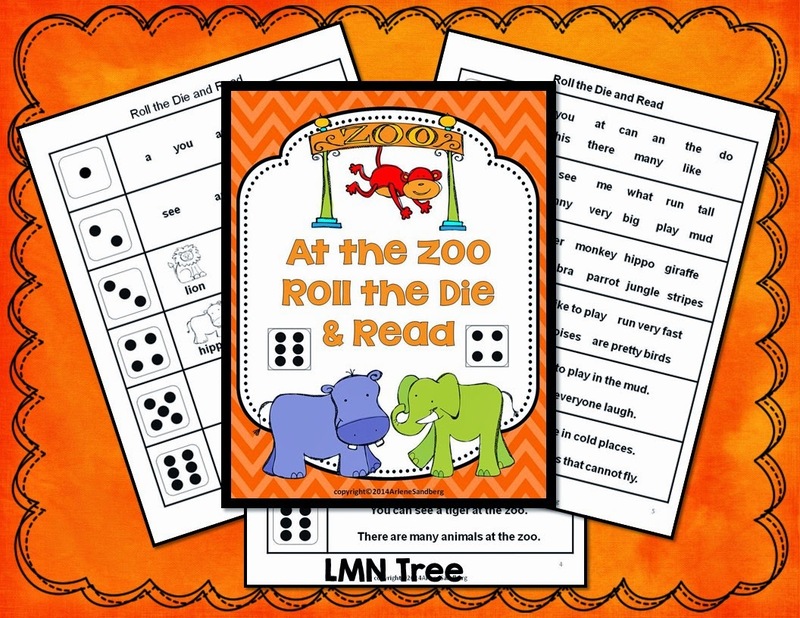 Of course I have a freebie for all of my followers and viewers: "At the Zoo: Roll the Die and Read." There are 3 different levels of this fun reading practice activity like the one below. Thank you all for making a difference for your students. I truly appreciate each and everyone one of you. Thanks Arlene! We are headed to the zoo in 12 days!